In today’s market, tax lien foreclosures are the new source of high-equity properties going through the foreclosure process. We’re not going to purchase liens at tax lien sales. We’re just going to follow the classic mortgage pre-foreclosure strategy with a different source of leads! 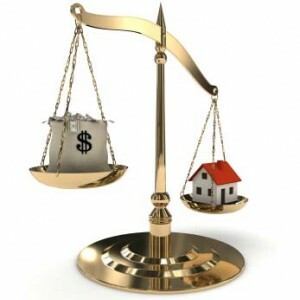 Mortgage pre-foreclosure investing has been a popular investing method for several decades now. Using readily available public records, investors approach homeowners who are going through the mortgage foreclosure process. hey then offer to purchase the property or otherwise profit from the situation, preventing many tax lien foreclosures from ever happening. This was not a bad strategy when prices were skyrocketing in the mid 2000s. Anyone who had owned their property more than a few years likely had “built-in” equity just from the rapid appreciation. Therefore it was a simple matter to find properties that had equity and get some deals going with the homeowners. So even though there were a lot of properties the fit the mold for the strategy, it often cost 5 figures to bail out a property from foreclosure. Plus, further monthly payments were required until the property could be disposed. Worst of all, you’d find youself dealing with a reluctant participant (the owner/occupant) who really didn’t want to do the deal anyway. It turns out that properties can be foreclosed for non-payment of property taxes as well. In many states, a tax lien is sold against a non-paying property. Eventually that lien threatens ownership of the property. For liens not paid within a certain amount of time, tax lien foreclosures begin. Now, in the majority of cases, the tax lien is paid by the owner or the mortgage company well before the ownership of the property is threatened. 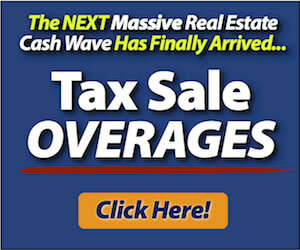 This prevents many tax lien foreclosures from ever taking place. By the time the tax lien reaches the late stages of maturity, most of the properties left do not have a mortgage. If they had a mortgage the bank would have likely stepped in and paid the property taxes to save their interest in the property. Most of these owners had inherited the property, or were deceased (I just contacted the heirs if that was the case). In other cases, the owner just moved on in life and didn’t want to deal with the property and keep making tax payments. This explained why the properties were free and clear and still entering the tax lien foreclosure process. Most owners did not live in the properties and were not emotionally attached to the properties. Because the properties were free and clear, all that needed to be done was to make a tax payment and there would be no further payments necessary for a number of years. This prevented a lot more cash going out the door while disposed of the property. Also, the amount to pay the taxes was usually much less than the typical amount needed to bail out a mortgage pre-foreclosure. If you want to get involved in a risk-free real estate method with motivated sellers and high-equity properties, this is the only way to go. See which tax lien foreclosures are about to take place by looking at past sales and seeing which liens are still unpaid. Get the owners of those properties under contract or even buy them out for a token payment of as little as $50. 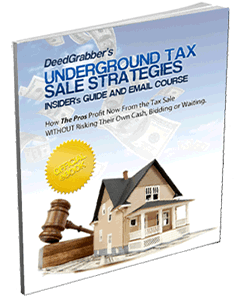 Grab my free report below, and you may soon be known as “the investor that STOPS tax lien foreclosures” in your area.